I first met Sarah online in the Blog With Pip course. I was struck by her heartfelt, reflective writing. Several months later we met at a blogger’s dinner. It wasn’t until I saw Sarah’s video for Edenland”s lipsynching awards that I knew she was bald. Her video was so bold, it did make me smile. I asked Sarah to tell her story for my Appearance Diversity series, and she said yes! She writes so beautifully and really explains how being stared at feels like. Meet Sarah. I have no hair and I wear a wig. 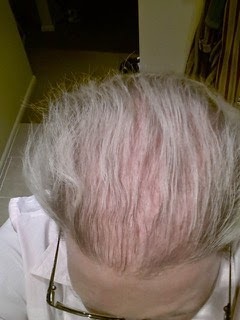 I have Androgenetic Alopecia, which is similar to male pattern balding. I have never really considered it a disability and never really thought about it as an appearance diversity issue, which of course it is. Because, we are not all born with a head full of hair, or if we are, we are not all destined to keep it and with sayings like “bad hair day” and “crowning glory”, it can very quickly define who we are, and cause extreme lack of confidence if we are not blessed with it. Androgenetic Alopecia is also known as Androgenic Alopecia. It affects far more women than people realise. Estimates vary, but around 10% of women appears to be considered prudent. In women, it is characterised by diffuse thinning all over the head, as opposed to men who lose their hair on the top and sides of their heads alone. It is a sign that something, usually hormonal, has gone awry in the body. In my case, and many many others, they have yet to find what exactly it is that is the cause. Mostly we suffer in silence, watching our hair end up on our pillows after a night’s sleep, slipping down the drain after we have washed it, ending up in the brush after we have brushed it. For those of us that are afflicted with a more serious case of it, we try to hide it wearing scarves, hats and the like. I started losing my hair after the birth of my daughter 22 years ago. I went to a dermatologist who explained to me that what I had was Telogen Effluvium which is something that can occur after childbirth. It is where the hair goes from the growth and transitional phase straight into the resting phase, which results in a mass shedding of hair. I was told that it would recifiy itself. It never did. In my thirties, my hair had become quite thin, especially on top, and, living in the UK at the time, I went to a trichologist (a specialist in hair loss) in Harley Street in London. The woman I saw told me that whilst she could recommend laser treatment and various supplements, the chances of them working were slim. It is something I would have to live with, she had said. I appreciated her honesty, and decided that was what I would do. I would live with it. Over the years, I watched my hair thin even more, but largely, and if I am honest, I have no idea why, it didn’t affect me. I used to sometimes wish for long flowing hair, but also realised that was foolhardy. Why torment myself with something that could not be. However, in late 2012, at the age of 45, I realised that I had lost so much hair, that people had begun to obviously stare. Previously, I know that people noticed and would politely avert their eyes, but now, instead of looking at my eyes when they spoke to me, people’s eyes would be fixated at my head. By this time, I was living in Australia and so I made an appointment with a hair loss clinic. I had thought that perhaps technology had advanced and that perhaps there was something I could finally do. Alas, it was not to be. The gentleman told me that the follicles on my head had in fact closed. He explained that hair loss is really only treatable in the first five years as after that the follicles atrophy and eventually close. Since my condition had been going for over twenty years, I was effectively untreatable. I didn’t feel that devastated to be honest. I just took the news and figured it would be okay. I went home and researched all the possible options I had. Hair transplantation was not an option as the technology, despite massive advancements, is still in its infancy and according to anecdotal reports was still a bit hit and miss, and a sizeable cost. My other two options were to live with it or wear a wig. Of the hair replacement systems out there, I tried two. Both involved me having to take the decision to shave off what little hair I had left of my own. As I watched my wisps fall onto the floor I admit to feeling a great sense of loss. I wondered if I would ever have my own hair again. After trying the lace system, which is a system whereby human hair is knotted onto a lace-like base and taped to your head, I settled on a vacuum wig which is human hair melded onto a silicone cap that suctions onto your head. Both have pros and cons, but in the end, for me, the vacuum wig was a better fit. It is a very expensive system, but for me it is the most natural looking, which means I can get on with my day without worrying if people are looking at me thinking I’m wearing a wig. I now have a head full of hair and people do not stare. I feel “normal” (whatever that means). It means that I can talk to people and have them fully engaged with me, rather than what is missing on top of my head. I love it. I am not ashamed of my baldness. I embrace it. I am empowered by it. I have taken photographs of myself bald and put them on my blog and Instagram feed. I am happy to remove my wig to satiate people’s curiosity and also to use it as a way to educate. As often as possible, when at home, I do not wear my wig. I admit, this freaks my son out a little, but it’s good for him to get used to me and also to see me comfortable with myself as a person. I do wear it when I am out. This is largely because if I go out wearing just my skull cap (like a beanie, but much thinner), I find people assume I am sick. Because I don’t have Alopecia Totalis or Alopecia Universalis, which is complete smooth baldness, because I have a little stubble on my scalp, people assume I am a cancer sufferer. They come up to me sometimes and ask me what I have or what treatment I am having. They are shocked when I say that I have alopecia. Almost like it is more acceptable to be sick with cancer and have no hair than it is to have Alopecia and no hair. So weird, our social mores. However, being human, I had not quite found the courage to walk outside completely bald until a recent trip to Daylesford. It is exposing to not have hair, and I don’t enjoy the stares. But we had booked a trip to the Bath House and whilst you can swim in the vacuum wig, I do worry about how the water treatment will affect the hair, and so choose not to wear it. I wore instead my white skull cap. However, it was busy and with all the splashing it became quite wet. My husband urged me to remove it. And so I did. My first appearance as just me. In all my bald glory. I was terrified. People did stare. They couldn’t help it. I understand. It is not everyday a bald woman enters the room. And I know they mostly assumed I was sick. A couple of women even moved themselves so they could get a better look and I did find it a little disconcerting at how obvious they were – they could not stop staring, like I was the hired freak. It worried me the example they were being to their children who were with them. But I had to get past that. I was there with my husband and 16 year old son. I focussed on them. And within a few minutes I forgot about the other people. By the end of our two hour session, I was wonderfully relaxed, and felt entirely liberated. I am not going to lie and tell you that I have ditched the wig. I do love it so I wear it. But if I am ever in a situation where I find myself not being able to wear it, I think I will be okay. 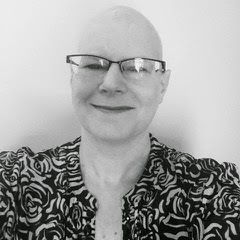 For me, it is being proud of the person I am and not letting my lack of hair define who I am. It is about saying my hair does not define my appearance as a woman, or my role as a woman. 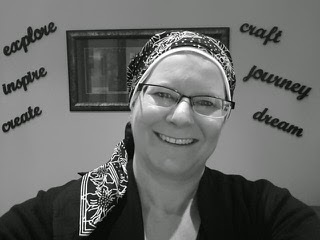 It is about saying that I own my hair loss, and adjusting my sails accordingly. It is about acceptance. It is about self love. It is about letting go. If you would like any information about my hair replacement system, please do get in touch via Carly, I would be more than happy to answer your questions. 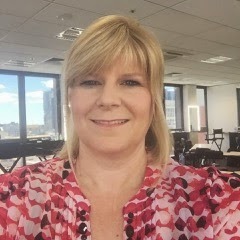 Sarah blogs at Sarah’s Heart Writes, and you can follow her on social media at: Facebook, Instagram, pinterest, twitter. I really enjoyed reading this. I'm a hairdresser and I've seen a few people with this condition over the years. The most memorable person was a little girl whose hair completely fell out at 8 years old. 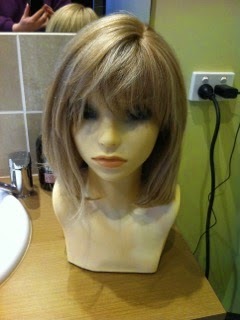 I cut a couple of her wigs, and her mother would tell me about school being very difficult for her daughter. Other kids would grab the wig off her head and throw it around. She'd be an adult now, and I often wonder how she's going. Yay Sarah & Carly!, beautifully written and what an amazing husband and son who support you in public and aren't ashamed. I love how you focused on the day with your family & not worry about those rude women at the pool. Thanks for posting this. My sister in law lost all of the hair on her head and body after the birth of her first child 16 years ago. She wears a similar wig. Not the same at all, but I will be shaving my head for the worlds greatest shave in march, and will be interested in experiencing life as a bald woman, albeit briefly. I know I say this all the time but I really do not understand people. I have to admit that when I see someone who is bald I often assume they may be undergoing cancer treatment but as it is none of my business, I don't ask. I certainly would not be disappointed if I was told there was another cause, in fact I would be relieved that you are not sick.